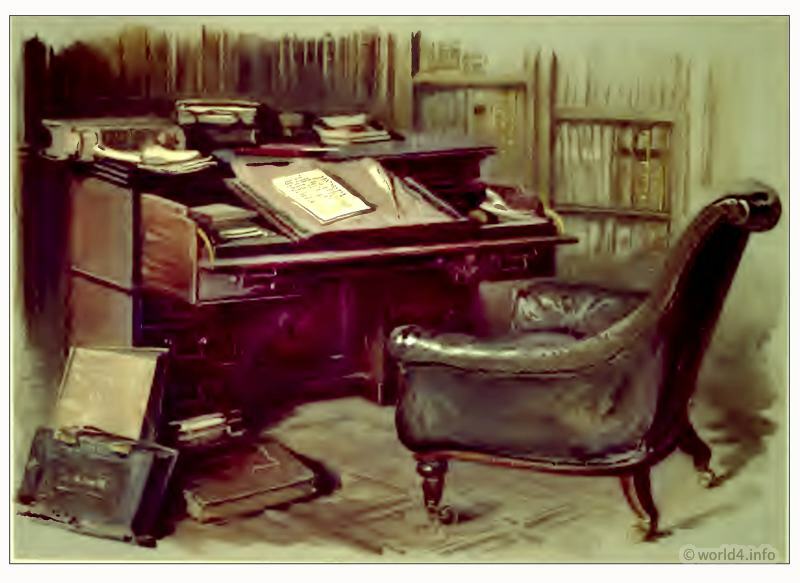 Abbotsford, desk and chair of Sir Walter Scott. Home » Abbotsford, desk and chair of Sir Walter Scott. Desk and chair of Sir Walter Scott. And again what can be more pathetic than Mr. Lockhart’s description of the opening of the desk on that sad day fourteen years later? “But perhaps the most touching evidence of the lasting tenderness of Sir Walter’s early domestic feelings was exhibited to his executors when they opened his repositories in search of his testament, the evening after his burial. On lifting up his desk, we found arranged in careful order a series of little objects which had obviously been so placed there that his eye might rest on them every morning before he began his tasks. These were the old-fashioned boxes that had garnished his mother’s toilette, when he, a sickly child, slept in her dressing-room the silver taper-stand which the young advocate had bought for her with his first five guinea fee a row of small packets inscribed with her hand, and containing the hair of those of her offspring that had died before her his father’s snuff-box and étui case, and more things of the like sort, recalling. Abbotsford; the personal relics and antiquarian treasures of Sir Walter Scott. Illustrated by William Gibb. “Pictures and Royal Portraits illustrative of English and Scottish History. This entry was posted in 1820, 19th Century, Empire, England and tagged Abbotsford, English history, Scottish, Sir Walter Scott on 7/9/13 by world4.